Hay and greens are the foundation for a healthy rabbit diet. 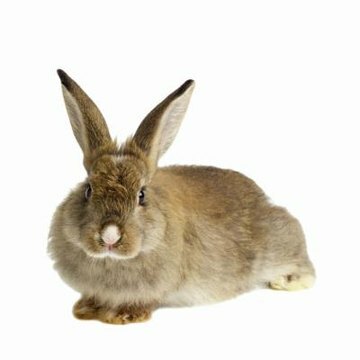 Even if you feed your bunny pellets, he's still getting a serving of alfalfa in every bite since that's the primary ingredient in most rabbit pellets along with wheat, ground oats and soybean meal. Your bun is harboring a secret, though: he would love to munch on a crispy snack to break the monotony of all that alfalfa. When you're making a treat for your bunny, incorporate foods that are good for him and ones that he'd eat anyway. Oats, carrots, celery, apples, strawberries and raspberries are all fresh and healthy foods your rabbit would enjoy. Thoroughly wash fruits and veggies before feeding them to your bunny or using them in a recipe for a treat. Some bunnies have a sweet tooth and would happily nibble on all the sugary snacks you'd allow them to. You can sweeten up your rabbit's treats naturally using fruits or a dollop of honey. If the abundance of yogurt treats in the pet supply store gives you the idea of dipping his snacks in melted yogurt to give them a sweet coating, you should reconsider. Even though you might think of yogurt as a healthy treat for your bun, it has added sugar that can cause dental problems as well as stomach issues and obesity. When you first make up a batch of bunny treats it's tempting to give your rabbit a fistful and let him munch away to his heart's content. But giving your bunny a limitless supply of a new food can traumatize his digestive system. Introduce the homemade snacks gradually, giving him only half of a treat at a time for the first few days then graduating to a full treat for the next three or four days. Since these are treats you're feeding him and not his regular diet, one or two a day or every few days once he's used to eating them is a sufficient amount. Also, if your bunny is under six months old, hold off on the treats until he's aged a bit. Young rabbits have delicate tummies and can easily develop a painful stomach condition called enteritis. If you have the time and want to bake up some bunny treats, all you need is five ingredients. Mix one pureed carrot with half of a mashed banana and one tablespoon of honey, then add 1/4 cup of ground rabbit pellets and 1/4 cup of ground oats. Work the mixture with your hands until a stiff dough forms, then roll it out on the countertop to 1/4-inch thickness. Use cookie cutters or a knife to cut the dough into shapes and place them on a cookie sheet that's been sprayed with cooking spray. Bake your rabbit treats in the oven at 325 degrees Fahrenheit for half an hour, then turn off the oven, leaving the treats inside for an hour as the oven cools. Make sure your bunny's treats are cooled to room temperature before you let him try them. Do Hay Racks Work for Rabbits?